So all the media rush to Tewkesbury, because that's an easy target and you get to use pretty photos of the Abbey doing an island impression. Lots of talk of 2007. 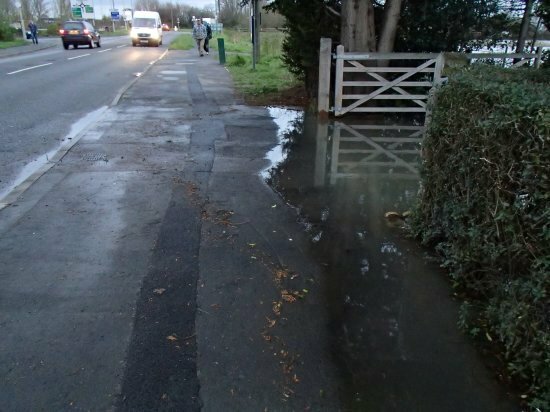 A lot of work has gone into improved flood defences since then, but still, worrying! Mid Tuesday afternoon we learnt that they were sending a hovercraft out to rescue some stranded people, and that sandbags would shortly be available from my local village hall. Translation: they're still expecting things to get worse. At this point I might have panicked a bit and legged it home from work. Mostly just so I could be safely home in daylight, and avoiding the traffic as if any more roads had flooded it would have been a potentially long and annoying diversion. Lots of sandbags around, and quite a few nervous looking people moving stuff around. All the 'little' brooks were huge and in the fields, with some big puddles on the road where the drains had given up trying to cope with it all. My road is slightly higher up, and according to one of my neighbours we just about escaped in 2007, so no sandbags for us this time. Luckily things didn't get any worse, and the Severn eventually did peak and is now dropping off slowly. But because the peak was 70cm lower than 2007 it can't have been that bad, right?! ugh. Took me forever to find this site, why did I think your website was your full name?